Sidrah Khan joined Stephen Lickrish and Associates in May 2006 and has worked as a diligent caseworker on numerous complex fraud cases, including a large electoral fraud case and several money laundering investigations by the Serious Fraud Office, HMRC and the Crown Prosecution Service. 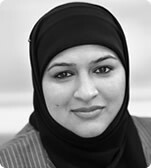 Sidrah completed her LL.B Law degree at Manchester Metropolitan University in 2004. In 2005 she went on to complete her LPC at the same establishment. She has now successfully completed the ‘Work Based Learning Scheme’ that was piloted over a two year period and the Professional Skills course. She qualified as a solicitor in 2011. Sidrah now primarily works within the General Crime department focusing on general crime cases ranging from Criminal Damage to Robbery and has worked on several high profile Murder cases. She plays a vital role within the department and also has the responsibility for billing the firm’s general crime cases. Sidrah is also fluent in Urdu and Punjabi.